Okay, so perhaps this scale for veterinarian use is a bit of stretch for a kitchen gadget blog, but the product picture is too hard to resist. (Plus, TGIF.) So if you came here looking for a kitchen scale, here is a nice, old one to look at. 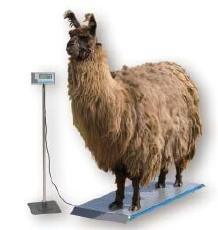 But if you need a vet scale, it’s hard to argue with a llama. At first, I could weigh my sacrificial animals on a plain old bathroom scale, but that grew impractical when I needed to graduate from chickens to livestock. Yes it will stand up to the test of weighing llama after llama, but as soon as you introduce alpacas to the scale, the cpu heats up considerably and discolors the white display area to an unsightly pinkish-brown. There are more great comments to be read, including of course, the requisite your mama is so fat jokes. Good stuff.